Do you have a taste for chic refinement? Top notch luxury hotel rooms are at your disposal in prestigious establishments on the Yucatan Peninsula. For the discerned traveler their excellent reputation guarantees only the highest standards of service within the finest surroundings. Use a commercial airliner if you wish, but Cancun and Merida are also easily accessible by private jet. Some hotels own a heli platform. Hacienda Merida is a small colonial property located in the heart of the city. With only 8 luxury hotel rooms it offers an exclusive escape from your no doubt busy days exploring the charming and elegant city and it's surroundings. If you are on business or simply prefer something more cosmopolitan then book your lodgings at the Fiesta Americana. It's perfect for conferences and events, located on Merida's famous Paseo de Montejo, Yucatan's equivalent of the Champs Elysees. You'll be only a 5 min. cab drive or 20 min. walk away from the historical centre. Below the hotel there's a luxury shopping mall. The Paseo the Montejo is filled with beautiful 19th century residences, some of whom have been restored and converted into a bar or restaurant. You don't mind driving a bit but you don't want to be too far out? 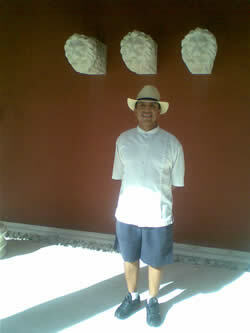 Check the Hacienda Xcanatun. Located at 12 km north of Merida on the road to Progreso it's still conveniently close to town. Xcanatun is a transformed henequen plantation with 18 luxury suites, run by it's owners. The truly wealthy and sophisticated traveler perceives luxury first and foremostly in exceptional guest service. And the truly wealthy and sophisticated keep trusting the Ritz Carlton for best customer service and product quality. Acknowledged winner of "Tourism Grammys" by the independent Luxury Institute and until recent years the only AAA triple 5 diamond hotel in Cancun. However, they can't make this claim anymore. JW Marriott has received the coveted award for 2008 and features one of Mexico's top Spas. So there's your alternative for opulence if your not a Ritz person. 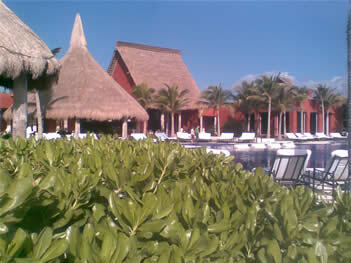 Along the Riviera Maya you'll find an ample choice of luxury hotel rooms. Many are in the range of 'affordable luxury' and likewise most offer the all-inclusive formula. If that's not your style your options are somewhat limited. In fact one of the few luxury resort hotels not all-in is the Rosewood Mayakoba or nextdoor Fairmont. In 2009 Viceroy and Banyan tree will ample your choice of luxury hotel rooms. And allthough this page is not meant to be about all-inclusives I want to mention the Mediterranean style Adult only Excellence Riviera and Blue Tulum Resort in Tulum just next to the ruins. One of my personal favorites is Paraiso de la Bonita, a small boutique-style hotel just off Puerto Morelos on the bay of Petempich. They throw in a 48-foot catamaran for private cruises to Isla Mujeres and Contoy, or wherever you want it to go. You'll have to pay for it of course, it's not included in your room. Decorated with antiques and handicrafts from all over the world, Paraiso de la Bonita makes one perfect spot for an idyllic luxury vacation!